As Facebook emerges as a publically traded company, CEO Mark Zuckerberg will need to learn how to balance the expectations of not only its users and advertisers but that of investors. Since the social network’s very beginning, Zuckerberg has stood by his company’s mission “to give people the power to share and make the world more open and connected” (Facebook.com). However, as Zuckerberg is looking out for the interest of social networking, shareholders are expecting a return on their investment, which can only be generated through advertising growth. This type of growth does not seem likely anytime soon, especially after the world’s top advertiser, GM, recently pulled all of its advertisements from the site. Citing trailing click-through-rates (CTR) when compared to other online options such as Google AdSense, GM decided to no longer invest money into Facebook advertising (AdAge). This move eliminated a large portion of advertising revenue that is, to say the least, displeasing to investors. Reports of low CTR, however, are no new phenomenon for the social network, which urges marketers to view the site not by the numerical CTR but through the less quantifiable branding presence it provides. In reality though, any company can build a strong Facebook brand presence without paying for Facebook advertising (AdAge). Also, the increasing use of mobile apps to access the site has dramatically reduced the number of consumers who even see Facebook advertisements (Market Day). This reason prompted shareholders to sue the social networking leader earlier today, claiming Facebook concealed the company’s prediction for future revenue reduction. 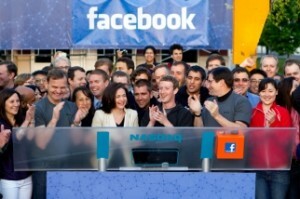 So, how is Facebook going to build the ad revenue investors are demanding? This is the big question Zuckerberg faces as he navigates through the cutthroat arena of Wall Street. After trading for only three days, Facebook’s overpriced stock is already down 18.4% and investors will continue to jump ship if expectations are not met (Market Day). Facebook continually urges marketers to look at the long term and not expect the social network to provide instantaneous results; investors are now realizing this dilemma with Facebook as well.